BREVARD COUNTY, Florida - High water levels in the Banana River portion of the Indian River Lagoon is preventing stormwater drainage in Cape Canaveral and north Cocoa Beach, Florida. Record rainfall from Hurricane Irma and subsequent record rain events in September and October 2017, coupled by the release of millions of gallons of water from the St. John's River through the C-54 canal have raised water levels throughout the Indian River Lagoon. Both Cape Canaveral and Cocoa Beach rely on the Banana River basin for natural and stormwater drainage. But the already high levels in the Banana River is causing standing water to be present in all of the storm water lines in Cape Canaveral and areas of Cocoa Beach north of State Road 520. 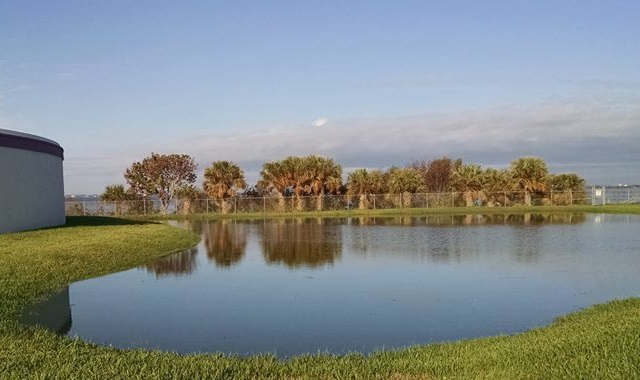 The City of Cocoa Beach is asking residents, especially north of State Road 520, to conserve water usage to decrease the amount of sewer and stormwater. "The lift stations are taxed and water has nowhere to go," said Cocoa Beach Mayor Ben Malik. The City of Cape Canaveral advised resident that the stormwater cannot completely drain until the water level in the Banana River recedes.